Lewis Bates has edged out older brother Harry in the first two stages of the Make Smoking History Forest Rally. Over two runs of the Trade Hire Busselton Super Special Stage, Lewis and co-driver Anthony McLoughlin go into Saturday’s action with a narrow 0.1 second lead over his Toyota Gazoo Racing Australia teammate. 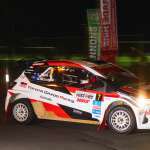 It was a dominant night for the Toyota Yaris AP4 pilots, with Harry and co-driver John McCarthy claiming the first stage and Lewis the second – but the overall bragging rights in the Bates household lie with Lewis. Shamrock Racing’s Richie Dalton and Dale Moscatt enjoyed a strong start in their Ford Fiesta G4 – third overall. Maximum Motorsport’s Tom Wilde Madelin Kirkhouse sit in fourth, while Snickers Racing’s Luke Anear and Steve Glenney round out the top five. Crews will head to Nannup early on Saturday morning for a further eight stages across the day on the fast flowing roads expected to provide plenty of interesting battles across the field.